Using a combination of draped and undraped live models, students will work on their figure drawing skills. Some drawing experience is recommended. For this session we will use the art of Phillip Pearlstein as a starting point. 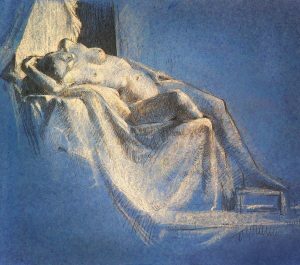 Whether you like his art or not, his distinctive approach to drawing the figure, leads to the consideration of various aspects of cropping, atmospheric perspective, pattern, lighting, contour drawing and modeling. Of course if you just want to work on your own, you certainly are invited and I will be available for critique and discussion. Some drawing experience needed to get the most from this class. Intermediate to Advanced level.